Posted on 10, October 2016 by EuropaWire PR Editors | This entry was posted in Automotive, Internet & Online, Italy, Media and tagged Abart, Hunger Magazine, Italian car brand, Paolo Gagliardo, Rankin, Tony C. Miller. Bookmark the permalink. TURIN, 10-Oct-2016 — /EuropaWire/ — Hunger Magazine and Rankin are proud to present a digital editorial collaboration with Italian car brand Abarth. 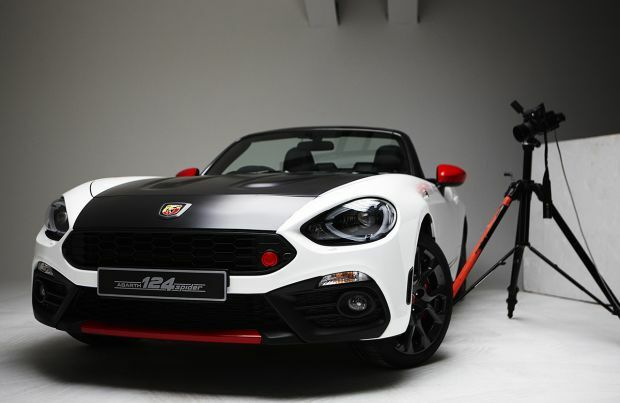 Showcasing the launch of the celebrated Abarth 124 spider, Hunger have created a film, stills and documentary campaign putting the pedal to the metal and maxing the throttle of entertainment. With the Rankin directed 60-second spot teased at the Paris Motorshow on Thursday 29th September, each feature of the campaign will launch exclusively on HungerTV.com, commencing on Thursday 6th October and running through to Christmas. The 360-degree project consists of an online film, three still life shoots and a mini documentary series starring celebrity talent, titled The Detour. Rankin: “Abarth approached Hunger looking to do something a little more leftfield than the usual campaign. Although working in different worlds, the two brands are a perfect match, with fashionable, fun and aspirational audience bases. With our in-house studio, filmmakers, photographers and journalists, we were able to create a multifaceted project all under one roof. The brand gave us complete freedom to bring their cars to life in fun and unusual ways getting behind the wheel and taking them to their limits”. The film and accompanying stills were shot by Rankin at London’s ExCel Centre, with cinematography from Tony C. Miller. More akin to a luxury fashion film than the typical car commercial, the film is a no-holdsbarred, full throttle love story, as the two lovers burn rubber and make their cars dance, set to the beat of a modern, dynamic drum track. The second phase of the release sees two stunning still life photographic shoots, showcasing both the Abarth 124 spider and Abarth 595. Dark and moody, they see the cars emerging out of the darkness, celebrating their power, passion and sleek sporting lines. The final release is a mini documentary series titled The Detour, starring soon-to-be-revealed celebrity talent. With more to come from Hunger and Abarth, fasten seatbelts and sit back: the journey is just beginning. Furthermore, a new level of performance can be discovered in another innovative project presented at the Paris Motor Show. “Abarth 124 spider Uncovered” is a digital fascination project for the new roadster. Technical and emotional contents are interconnected in a narrative loop created to draw users into a dynamic experience. The starting point is a film with unmistakable style: British photographer Rankin portrays the sound and performance of Abarth 124 spider from an innovative point of view, at an irresistible pace. The Abarth 124 spider Uncovered platform can be reached from the model page on the Abarth portal and from dedicated posts on the brand’s social media channels. Users will choose content to be inspired by and get to know new details and potentials of this one-of-a-kind car. Finally, responsive layout makes the experience accessible from all devices at any time. Because you cannot tell when the thrill of drift will hit: you can only indulge it.